To create a smartphone and tablets app able to offer an easy-to-find experience within the huge catalog of CanalSur programs and contents. A non digital native users UX&UI design, including a custom made API to integrate with Canal Sur feeds, live signals and content repository. 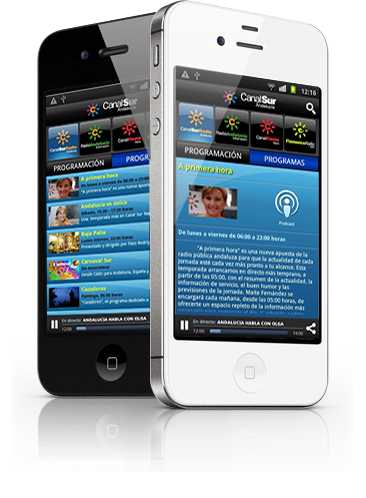 Enjoy all the Canal Sur Radio programming on your smartphone anywhere, anytime. Listen live programs of Radio Canal Sur, and follow all of its programming with announcements beginning of the program. Also, if you could not enjoy your favorite show, go to podcast Canal Sur Radio. Best of your radio on your hand, Canal Sur Radio. You will like. – Live broadcasts of Radio Canal Sur Andalucía (including local broadcasts), Andalusia Radio Information, Canal Fiesta Radio, FlamencoRadio.com and special broadcasts. – Daily Programming radio stations. – Warning alarms start of the programs.